1 - Plasterboard is treated with additives to give it certain unique properties. These additives can vary the strength and weight of the plasterboard. 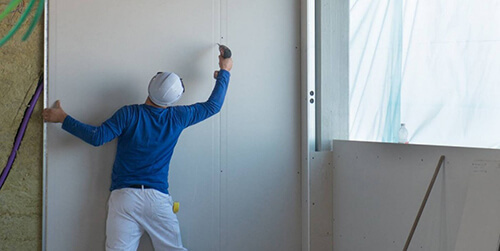 Fire-resistant plasterboards are ideal for family dwellings such as apartment buildings, where local and government building standards will require fire-retardant materials to be used during construction. Moisture-resistant plasterboard is primarily intended for use in basements and bathrooms where the plasterboard will be constantly subjected to humid air which is why these types of boards are specially treated to make the water resistant. Standard plasterboard does not have any additional characteristics that provide water or moisture resistance and as such should only be used on interior ceilings and walls where moisture is not an issue. 2 - Plasterboard is made by sandwiching an inner layer of gypsum between two outer layers of lining paper. The gypsum layer also includes various different types of additives and the lining paper can also vary in weight and strength which will result in different properties and finish the plasterboard. Plasterboard was invented in the 1900s by USG. 3 - Gypsum is formulated by using crystals that contain a small amount of water and can often be referred to as "water of crystallisation". In the event of a fire breaking out the water from the crystals is driven-off which helps in keeping the temperature of the fire lower and preventing the fire from spreading rapidly. Due to the nature of crystals in the gypsum, plasterboards such as Celotex, Knauf, Gyproc and Hafele which we have in stock at Building Supplies Online are extensively used in areas that require fire protection and with some special multilayer systems like Knauf Fireshield Fire Resistant Plasterboard available at Building Supplies Online up to 4 hours of fire protection is possible. 4 - Plasterboard is very good at reducing noise transmission and in particular music and speech that travels through the air. High performing noise reduction plasterboards such as the Gyproc Soundbloc Acoustic Resistant Plasterboard which has a high mass core that gives the board vastly superior protection from the effects of noise or the Knauf Soundshield Acoustic Wallboard which is a lot heavier than a standard plasterboard sheet but it will greatly reduce any noise impact in adjacent rooms or properties are both available at Building Supplies Online and have been specially designed with a core that provides even more insulation against sound than standard plasterboard. 5 - If you are building or redecorating an area that will remain constantly damp such as a bathroom, kitchen or toilet you should not use standard plasterboard as this is not ideal for moisture dense environments. For areas that will have increased moisture, it is advisable to use a suitably moisture resistant plasterboard such as the Knauf Moistureshield Plasterboard which is a high-performance internal plasterboard for use in areas where there is high humidity and temporary external exposure or the Gyproc Moisture Resistant Plasterboard which is specially designed to tolerate moist and humid conditions, is protected by silicone additives and coated on both sides with water repellent liners. The Gyproc moisture resistant plasterboard also absorbs less than 5% of water by weight and offers excellent fire protection. 6 - Plasterboard can also be made with glass-fibre reinforcement and as a result, this type of plasterboard is not made with lining paper in the traditional way. The plasterboards are layered with glass fibre immediately below each surface which increases the plasterboards strength which makes them ideal for soffits and semi-exposed areas as they can be used on curved surfaces and easily bent whilst retaining their high-quality finish and providing a good all-around performance. 7 - All plasterboards that we have available at Building Supplies Online come with the option of either a square or tapered edge. Square edged plasterboard is normally used for textured finishes whilst tapered edge plasterboards are perfect for either skimming or jointing. 8 - Plasterboard has been designed to suit the standard 600mm stud spacing used in most of the housing being built today and generally comes in sheets that are 1200mm wide. At Building Supplies Online we also have plasterboard in stock that is available in other widths ranging from 600mm sheets if space is limited, up to 900mm sheets that can be used for metal stud partitioning. 9 - A big benefit for the environment is that the paper liners used for plasterboard are generally made from some form of recycled paper. Standard plasterboard comes with one brown side and one ivory. Plastering plaster should not be applied to the brown side of the plasterboard as the paper liner on the ivory side has been specially designed for applying plaster. 10 - Before applying wallpaper onto the plasterboard surface it is best to use a drywall sealer like GYPROC Easi-Fill Plasterboard Adhesive which is available at Building Supplies Online. This drywall sealant is an acrylic sealant and adhesive that can be used for sealing air gaps in Gyproc plasterboard systems.